Your Pie at the Canton Exchange is opening Friday, January 25th. Your Pie is the world’s originator of the fast casual, brick-oven, customized personal pizza category. Their signature menu items include home-made and hand-tossed craft pizza, paninis, salad, Italian gelato, craft beer and wine. 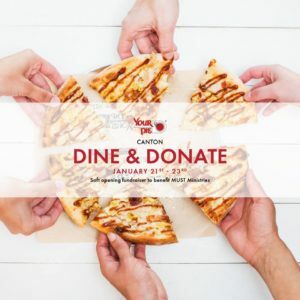 The co-owners, Arnie and Jenna Seyden, are offering complimentary individual pies for their Dine & Donate event on Monday 1/21-Wednesday 1/23 helping their staff train while also collecting donations for MUST Ministries. We are excited to be part of the Canton Community and know the Your Pie experience is the perfect family experience for lunch and dinner. Your Pie was brought to life 10 years ago in Athens, Georgia by Drew French. Now, the Your Pie experience is in more than 50 communities across the country. With more than 17 vegetable toppings, 8 meat toppings, and 5 sauces, what will you choose to make your customized pizza or salad? Follow Scoop for the latest updates around town.